The company Gates co-founded appears to know how to collect all right. In India, Microsoft has been vigorously pursuing piracy cases against companies which they suspect are using unlicensed software and has filed lawsuits against dozens of companies they accuse of copyright infringement. According to one report, the software giant is said to have filed about 80 cases in the Delhi High Court against companies using pirated Microsoft products. In the most recent case, Microsoft had filed a copyright case against Kamlesh Kumar Jha, owner of KK Software Solutions, and others for allegedly counterfeiting Microsoft products. In the case filed in Delhi High Court, Microsoft has sought damages for the Rs.5.71 crore loss it claims to have suffered. This, the company said, was the value of the copyright infringing Microsoft software that was seized by the Central Bureau of Investigation (CBI) during the raids it had carried out on the premises of the Delhibased KK Software Solutions three years ago after a criminal complaintfiled by the software giant. According to reports, CBI had carried out raids in several cities across several states. This was an eye-opener. One had no idea that CBI could be drafted into such raids, although it has become common practice for the Delhi High Court to issue injunctions and orders that allow Microsoft to inspect the computers of companies against which they have filed copyright infringement cases. How does Microsoft get to know that a company is violating its copyright by using unlicensed software? According to some people familiar with the process, the Business Software Alliance (BSA), which represents the world’s largest software developers, also polices the market by offering huge rewards to informers. Such information is passed on to BSA members and the rewards apparently are commensurate with the value of the catch that such information leads to. The most curious of Microsoft’s lawsuits relates to the case that is now in the news, both here and in the US. In January, California attorney general Kamala Harris filed a case against Pratibha Syntex, a vertically integrated knitted garments manufacturer operating from Pithampur, Madhya Pradesh, and Ningbo Beyond Home Textile Co. of China of gaining an unfair advantage over Californian companies by using pirated software in clothing production. The American apparel manufacturing industry, centered in Los Angeles, has become increasingly reliant upon software in the manufacturing and on-time inventory and shipping of apparel, says the lawsuit. “These law-abiding companies spend substantial capital on licensed software. 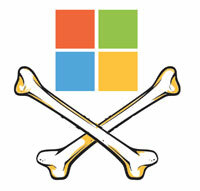 Overseas companies that pirate software used in apparel design, obtain a critical short-term advantage over their American competitors.” In her complaint filed in the Los Angeles court, Harris said Pratibha Syntex had violated California’s competition law by not paying licensing fees to Microsoft. That is, by not paying for software while their license feepaying competitors do, overseas apparel companies had gained “a substantial and unfair cost advantage in an industry characterized by very thin margins”, she claimed. According to details of the Delhi lawsuit, Pratibha had just five software licences from Microsoft while it using many hundred computers, a fact uncovered during snooping operations. Subsequently, the court allowed the software giant to inspect the company’s computers. Pratibha has, according to Spicy IP website, filed a counter case of fabrication of evidence. So what exactly is the reason for Harris’s intervention? Does the California attorney general have a locus standi in this case? Do her claims hold water? What happens next in the Delhi court might provide some clues. If you don't need a particular specialised software that only runs on Windows, go with Linux and be free of this forever. It's changed a lot from the geeky old days.